After constantly crunching the gear change in a 1934 Box Saloon, I referred to the experts who sagely nodded their heads and intoned “weak synchros”. This phrase was subsequently translated as meaning that the box would need to come out for some TLC. 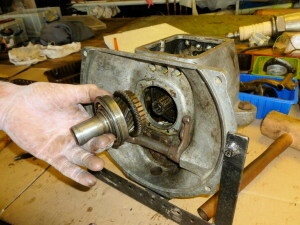 It just so happened that a spare gearbox came with the car, and it had synchromesh on 2nd gear so the cunning plan was hatched to overhaul the spare gearbox and then swap it for the tired synchro version in the car. Most of the technical side is amply covered in the Austin Seven Manual,by Doug Woodrow, but I thought I’d put in some of the technical wizardry I witnessed. It was decided that as it was going to be a full overhaul, then the selector balls and springs were going to be replaced as a matter of course and that bearings would be replaced as necessary. Any other faults found along the way would also be rectified. The initial dismantling was carried out as per the manual with the exception that when the manual tells you to put the gearbox in the oven at 100 degrees to ease bearing removal then a less wife antagonising solution was favoured. Domestic strife will be avoided if you use your trusty hot air gun, of the paint stripper type. 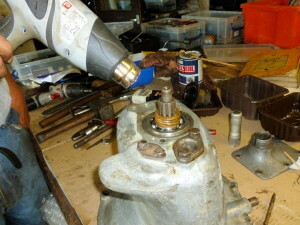 Instead of filling your kitchen with smelly, oily fumes and the screams of the memsahib, then merely heat up the appropriate portion of the gearbox casing (in the garage/workshop) using the gun to expand the aluminium and the bearing can now be eased out. ….followed by the change speed gate. 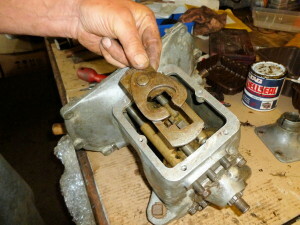 The selector rods and forks were then unscrewed and removed, taking care to collect the selector balls and springs. Overhaul and replacement of the selector balls and springs was covered in 1st Gear Jumps out and Does your Austin jump out of Gear? At this stage check that the synchro gears are tight on the synchro hub. If not, they can be tightened when the box is disassembled. Remove the front and rear gearbox covers. Warm the brass speedo gear; it will then slide off. 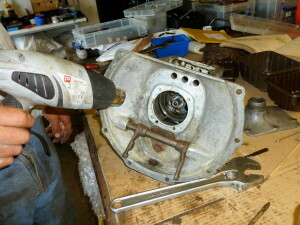 Warm the rear of the gear box around the lay shaft and remove the lay shaft as per the manual. Once again removal of the 1st motion shaft complete with bearing is eased by first heating the surrounding housing with the hot air gun. 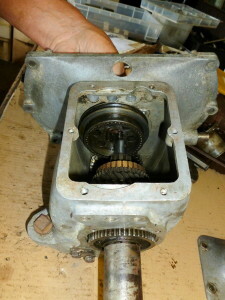 Push the whole gear assembly forwards to expose the 1st motion shaft bearing to allow removal of the bearing. Move the 3rd motion shaft backwards and now, carefully ensuring that the 3rd and 4th speed coupling sleeve and synchroniser do not separate, move them forwards off the main shaft and carefully remove as one piece. If they become separated then the synchroniser balls and springs will escape and result in a further job which you may not have anticipated. 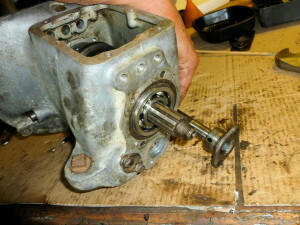 Extract the rear bearing. 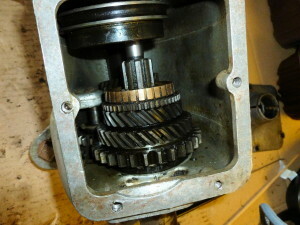 It will take some fiddly manoeuvring but the rest of the gears with the 3rd motion shaft can now be removed from the housing. Reverse gear was left undisturbed. Examine the components for any additional wear/damage and assess the need for repair and/or replacement of parts. 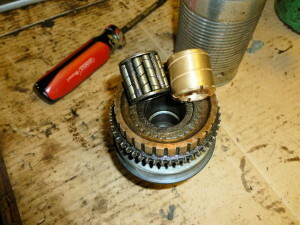 In this case both bearings felt gritty on rotation and so were replaced, including the roller bearing on the inside of the 1st motion shaft. 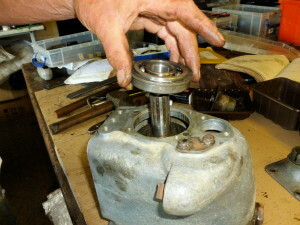 Be aware that replacement bearings may be supplied with an oversize bearing circlip. Use the old one. 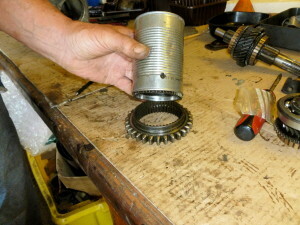 Assemble the 3rd/4th speed sleeve and synchroniser using the tin can method as described in the Austin Seven manual if they have become separated. Reassembly is the reverse of the above procedure with the following tips. Lay the lay shaft gears into the gearbox housing, but do not fit the shaft. Refit the 3rd motion shaft assembly complete with all gears except the 3rd/4th synchroniser and sleeve. 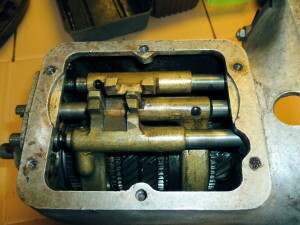 Once in the gearbox the main shaft and gears were locked into position at the back end of the gearbox using a special tool. The 3rd/4th synchroniser and sleeve can now be refitted again being careful not to let them separate or the synchroniser balls will be lost. 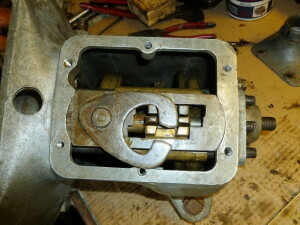 Heat the front of the gearbox housing and fit the 1st motion shaft and bearing. 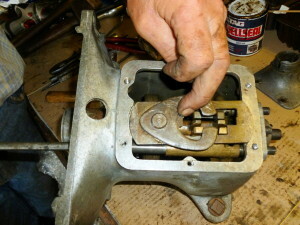 Don’t forget to include the new brass intershaft bush to replace the needle roller. 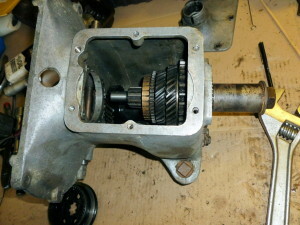 Heat the rear of the gearbox housing and fit the 3rd motion shaft bearing and housing. 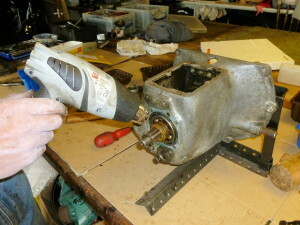 Refit the lay shaft, ensuring that the lubrication hole on the lay shaft is in the upwards position, replace the bolts and tighten. 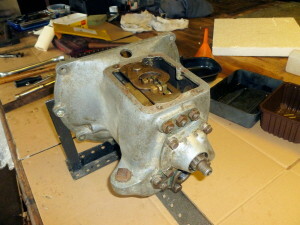 Refit the selector forks and selector balls and springs. Be aware that if the holes for the springs and balls are not completely clean, then any dirt and grit can make the refitting task very difficult. Refit the change speed gate with the selectors in neutral. 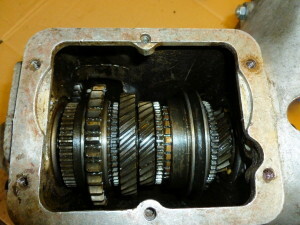 Warm the brass speedo drive gear refit. Replace and secure the front and rear covers. 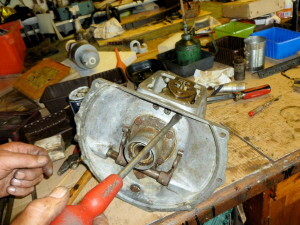 Replace prop shaft flange and tighten. Using a screwdriver adjust the position of the fork rods so that the gap either side of the interlock arm is equal for each fork rod. Refit top cover and drain plug. Don’t forget to fill with oil before use! This article, written by Dai Barnes, originally appeared in CA7C Seven Focus in Feb 2016 pp12-18.